Here is Hector Villegas and Victor Chavez representing Izcalli as we arrive at Proyecto Jardin. This place has a positive vibe where they grow all the herbs for the Yerbia Mayahuel products. 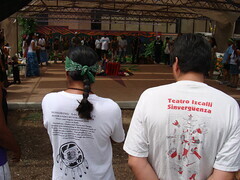 We were presented with a staff here by an elder and were also given really nice t-shirts as well. We carry the staff with honor and continue to pray for places like this garden to exist in urban settings.